I am still thinking about Lady Xia’s pet gibbon, the first and last known representative of its kind, and the subject of yesterday’s post. After I wrote about the interwoven fates of rice and trees and men and apes, I spent a long time looking through Ferrebeekeeper archives for the beautiful gibbon poem which I alluded to in the essay, but I came to realize that I never did write about it, so today’s post is another post about pet gibbons in ancient China. Bear with me, for the poem is an exquisite piece of history, and a remarkably soulful examination of pets…and of the winsome sadness of life itself. The poem was written by Wen Tong (1019–1079AD), a scholar-artist of the Northern Song Dynasty who was famous for his bamboo paintings. Allegedly he could simultaneously paint different stalks of bamboo with both hands, and lovely examples of his work are still extant a thousand years after he painted them…as is poetry about his favorite pet (As an aside, medieval China featured a class of learned polymaths who were masters of writing, erudition, gardening, and “painting without financial reward”: there is no clear career analogy in the modern western world although the painting without financial reward part sounds rather familiar). Wen Tong wrote about his love and admiration for his pet, and the poem quietly reveals a great deal about the household mores and emotional norms of well-to-do life in the Northern Song dynasty (note how the painter has so many retainers that he just passingly assigns one to look after the gibbon). It is a lovely and heartfelt window into a vanished world which is well worth examining line by line. As a poetic device, the back-and-forth switches from first person to second person keeps readers attentively off balance and yet draws them closer to both Wen Tong and his gibbon. Although, the writer’s privilege and possessiveness shine through, so does his kindness, playfulness and curiosity (perhaps there is a reason he got on so well with his remarkable pet that we are still thinking about it all of these centuries later). However, the final stanzas transcend the writer’s time and place. The poem speaks to the uneasy and fraught relationship we have with our fellow life-forms. For animals have their own lives and hearts and spirits, no matter how much we want to love and possess them. Wen Tong also delves into the realm of the existential, questioning the apparently painful randomness of fate, which mocks notions of ownership and control. Don’t let my clumsy words put you off reading the actual poem (coincidentally I have taken the whole translated work from “Altruistic Armadillos, Zenlike Zebras: Understanding the World’s Most Intriguing Animals” By Jeffrey Moussaieff Masson). It really moved me greatly and I hope you will also find it to be equally enchanting and sad. Obtained a gibbon for me and had it delivered from afar. And his swift and nimble movements were a delight to watch. And seemed to have lost all desire to return to his mountains. So I set him free and let him romp about as much as he liked. On hot days he would sit by the flowers and doze facing the sun. He would hang upside down or jump about showing his tricks. So that he never even once lacked his seasonal food and drink. Yet the other day his keeper suddenly told me the gibbon was ill. Offered him persimmons and chestnuts, but he didn’t glance at them. And I realized that this time he was really in great distress. After having swallowed them you would recover at once. Why did the medicine fail now, though given several times? Very early I sent someone to inquire, and he reported you had died. I was tormented by repentance and bitter self-reproach. You could be happy only when near your towering mountains. You had been yearning for far plains and dense forests. And that was why your allotted span of life was short. So that at least the insects would leave his remains in peace. When he heard about this, slapped his thigh sighing without end. Then, back home, he wrote a long poem of over a hundred words. Reading those lines my lonely heart was filled with sadness. Well had he expressed the grief caused by my gibbon’s death! Then, looking up at the bare branches, I burst out in tears. 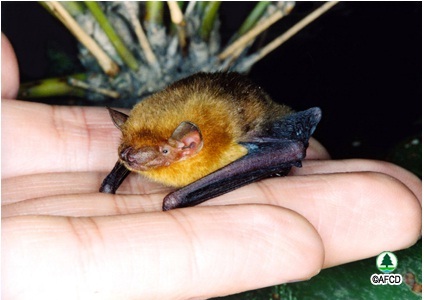 One of the smallest of all mammals is the Lesser bamboo bat (Tylonycteris pachypus) also known as the bumblebee bat which lives throughout Southeast Asia. The animals range from India and China down through Myanmar, throughout the Malaysian Peninsula, and across the island chains of Indonesia and the Philippines. The tiny flying creature is ridiculously small and measures only 40 millimetres (1.6 inches) in length with a wingspan of 150 millimetres (5.9 inches). An adult bat weighs approximately 1.5 grams–only slightly more than a paper clip. As you will notice from the photo, the bamboo bat has a flat skull. 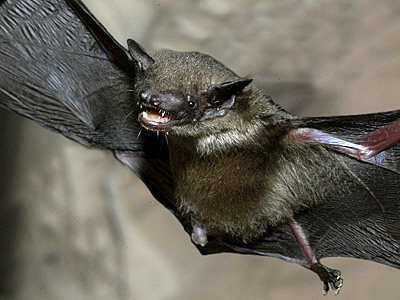 This is to aid the creature as it crawls into its daytime hideout—a single segment of bamboo—which the bat is capable of squeezing into through cracks of as little as 4 millimeters in width (if you didn’t pull out your desk ruler earlier to assess the size of this bat, you should do so now to remind yourself how small 4 millimeters is). Like most vesper bats, the lesser bamboo bat lives on flying insects which it catches in the dark night skies by means of sonar and extraordinary flying prowess. 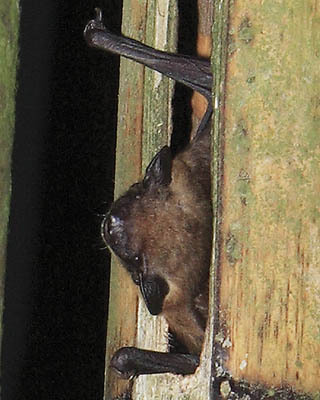 The lesser bamboo bat is said to have a particular relish for termite swarms. Today we present the lovable red panda (Ailurus fulgens), an endangered mammal which is the only species of the only genus of the family Ailuridae. Weighing up to 15 pounds red pandas are shaped like cats—indeed their scientific name means “shining cats”—however they are not at all closely related to cats and their nearest cousins are in the superfamily Musteloidea (which includes raccoons, coatis, skunks, as well as mustelids like otters, weasels, and badgers). 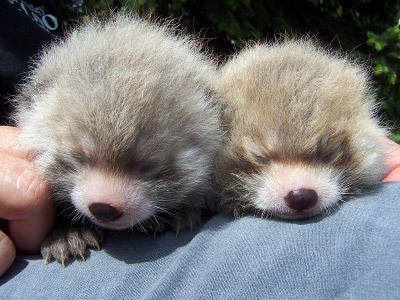 These kinship bonds between the red panda and the other Musteloidea are not especially close: the red panda is a living fossil and taxonomists are still arguing about where to put it. 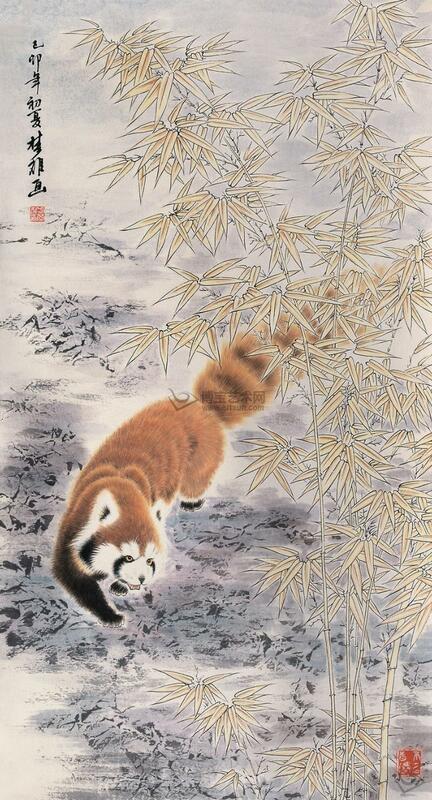 During the Miocene era (approximately 20 million years ago to 5 million years ago), close relatives of the red panda spread around the temperate forests of earth. Remains of a very similar creature, Pristinailurus bristoli, were found in the magnificent Gray fossil site of Tennessee and fossils of other red panda like creatures have been found throughout Europe, Asia, and North America. However, today the family consists of one last surviving species which is indigenous only to the high temperate forests of the Himalayan. The animal can be found in India (in Sikkim & Assam), Tibet, Bhutan, in the northern tip of Myanmar, and in southwestern China in the high forests of Yunnan, Sichuan, and Shaanxi. 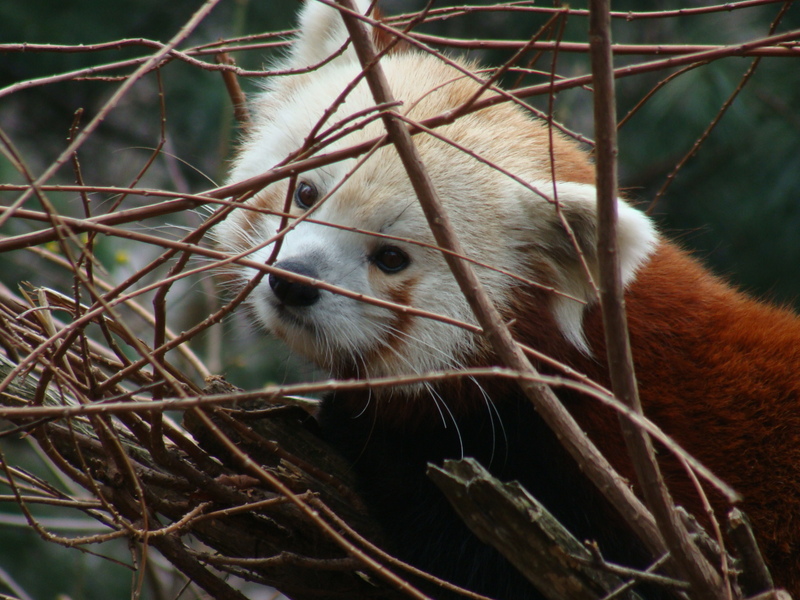 Unfortunately, throughout its range the red panda is endangered from hunting and habitat loss. They are hunted for their glorious red striped coats and bushy tails which help the creatures survive the cold and blend in with lichen-covered trees (but unfortunately attract our primate eyes). Red pandas predominantly dine on bamboo, but they are omnivores who also consume small mammals, birds, eggs, blossoms, and berries. In captivity they have been observed to eat the leaves, blossoms, and fruit of maples, beeches, and especially mulberries (perhaps this is what their extinct relatives in Europe and the New World ate). They are solitary arboreal animals who carefully guard their forest territories and seek each others’ company only during mating season. 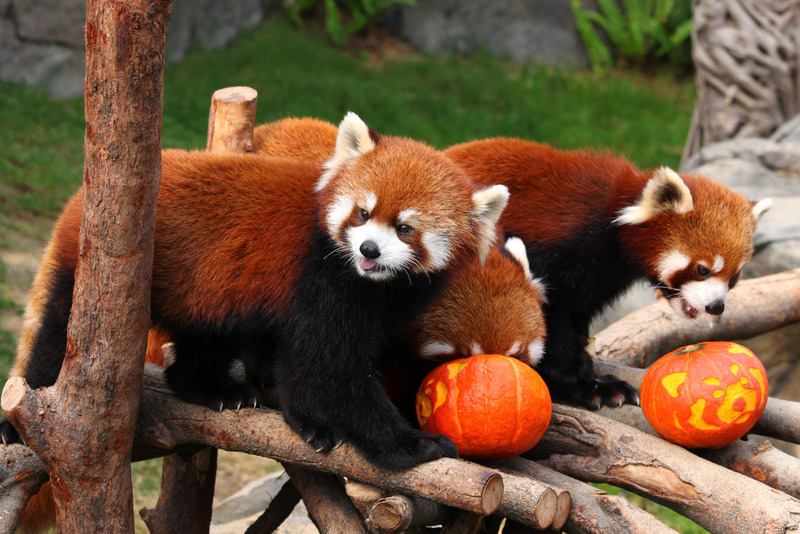 …although apparently they do fine together when they are eating pumpkins carved with their faces…. The red panda was not well known during the twentieth century, but because it flourishes in zoos it is becoming ever more famous among new generations of zoo-goers. To reiterate, the animal flourishes in zoos even as it vanishes in the wild, so some day the red panda might be like that other magnificent orange Asian mammal, the tiger (which are now far more numerous in captivity than in the wild). 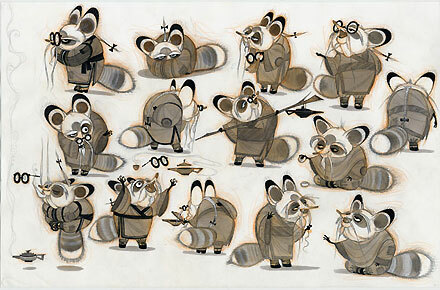 Thanks to their success in wildlife centers, red pandas are growing more popular in the media world: in the 2008 film “Kung Fu Panda” an animated red panda was featured as the venerable dojo master Shifu, voiced by Dustin Hoffman (who has admitted to knowing very little about the red panda before taking on the role). Sikkim has adopted the animal as its official state animal and red pandas are also the mascots for the Darjeeling tea festival. All of this matters in a ever more human-dominated planet where a species’ charisma to people is what is likely to keep it from going extinct. Speaking of charismatic red pandas, the world’s most famous (real) red panda is a male red panda named Babu who lives at Birmingham Nature Centre, in England. In 2005 Babu escaped into the suburban woods and, like Mia the cobra, attained media stardom before being recaptured. He was subsequently voted Brummie of the year (A Brummie apparently being a resident of Birmingham). I have often watched Red Pandas at the Bronx, Central Park, and Prospect Park Zoos and I am surprised they do not have a similar designation in New York City. No animal could be more designed to tickle human tastes or appeal more directly to the “cuteness” short circuit of our brain—at least until the red pandas smile and reveal that their jaws are filled with needle sharp teeth.